Our Flower Shop Ltd. is a family run flower shop that serves Medicine Hat, Redcliff, Dunmore, Desert Blume and surrounding area. The web server used by Ourflowershop.ca is located in Culver City, USA and is run by Media Temple. There are many websites run by this web server. The operator uses this server for many hosting clients. In total there are at least 486 websites on this server. The language of these websites is mostly english. 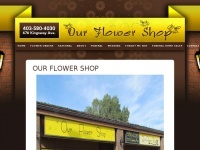 The Ourflowershop.ca websites were developed using the programming language PHP and served by a Apache server. XHTML 1.0 Transitional is used as markup language on the webpages. To analyze the visitors, the websites uses the analysis software Google Analytics. Indexing the data of the website and following hyperlinks on it is explicitly allowed by robot information.